Difference between revisions of "Kotemon"
A Reptile Digimon aiming to become a top-class swordsman amongst Digimon. Despite being untalkative, it is hardworking and diligently undergoes training behind the scenes. Its true appearance is a mystery, as it never removes its defensive gear. Although it has a timid personality and cries easily, it cares deeply for its friends and has a strong sense of justice, also showing its strong-willed side from time to time. Its Signature Move is striking at the enemy's arms with an electrified attack (Thunder Kote). 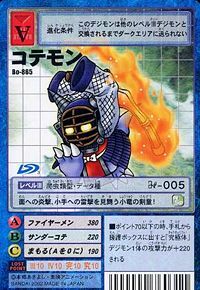 Its Special Move is covering its Shinai in flames and aiming for the opponent's head (Fire Men). Belongs to the Human Digimon. 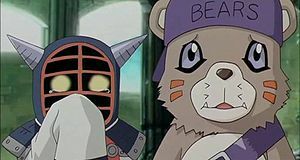 It is close friends with the Beast type Bearmon. It is pure-hearted and gives its all in everything it does. It strives to revive Ornismon in order to stop the war. | Kote (籠手) is a type of kendo gauntlet. Fire Men  Fire Mask ファイヤーメン Faiyā Men Hot Head/Hot Head Strike Covers its weapon in flames and strikes at the enemy's head. An electricity-charged blade stroke aimed at the enemy's arm. 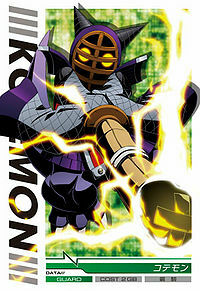 Kotemon is the younger brother of Dinohumon on the side of the human type digimon. His best friend is Bearmon. 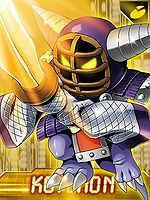 He is deleted by Ornismon, turning to a Digitama, when he tries to guard the mural of Ancient Greymon and Ancient Garurumon. 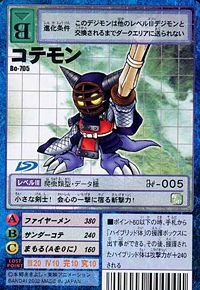 Kotemon is one of the Digimon collected by Akashi Tagiru. He trained both Tagiru and Kenzaki Musashi in kendo, and voluntarily joined Tagiru's collection during a fight with Tobari Ren and Yaksamon. 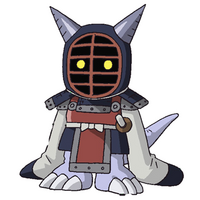 Kotemon is one of the starter partner Digimon. He can evolve to Dinohumon at level 5, Kyuukimon at level 20, and Slash Angemon at level 40. Kotemon can be evolved from Caprimon if above level 8 and Holy EXP above 200, or can be found at Cliff Valley. He can evolve to Dinohumon if above level 13, or Dark Lizamon if above level 24. 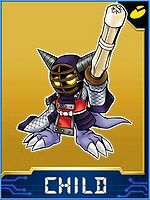 Kotemon is available as a Digimon Medal. 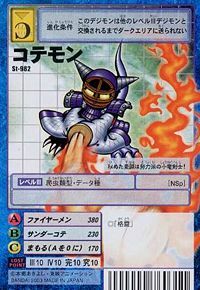 Kotemon is available as a Digimon Card. This hardworking, small dragon swordsman hides its true face! A small swordsman! The power to kill lies in its slashing attack! 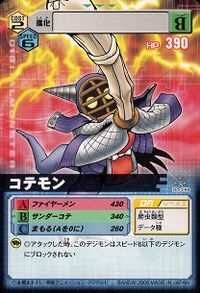 This small, sword-wielding dragon kid unleashes a fire attack on the mask and a thunder attack on the gauntlets! A swordsman Digimon whose true appearance is a mystery, due to it keeping its defensive gear on all the time. It continues to train hard in order to become a first-rate swordsman. Although it cries easily due to its cowardly personality, it cares deeply for its friends and has a strong sense of justice. 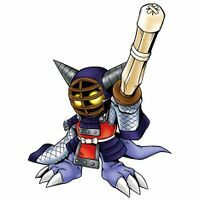 ↑ Digimon Frontier: Revival of the Ancient Digimon! !